NFL ‘London': Will the 2015 Jaguars Be a Success or Failure? NFL ‘London’: Will the 2015 Jaguars Be a Success or Failure? Child labor laws notwithstanding, one of our first experiences with commerce or work of any kind is selling things like cookies or raffle tickets door-to-door. When you’re a little kid coming to the door, your cute mug might be enough to elicit a pity purchase or at the very least, a polite decline, but when you’re a grown adult doing that sort of thing, and the product is cable television or some elaborate home security system, the odds are pretty slim that you’ll keep that door from slamming. It goes without saying that you probably wouldn’t go in talking obnoxiously with your hair disheveled while you eat a sandwich that inevitably leaves a stain on your shirt. Not if you actually wanted to get this job, that is. When it comes to securing London as a location for future business, however, the NFL has gone in with one of its mustard stained shirts two years running: the Jacksonville Jaguars. Assuming the NFL really is serious about its interest in London as a future, permanent prospect, you have to wonder what the rationale behind shipping the Jags over there on an annual basis is (they’re going back again this year). Whether the train of thought here is to eventually just outsource the Jags to the United Kingdom or to get at least one (if not more) expansion teams there in a kind of NFL Europe revival, the logic here isn’t exactly obvious. With respect to the team and their fans, the Jaguars should’ve never been the league’s elevator pitch in the first place. With the exception of their mid-to-late 1990s heyday and a brief period during the Byron Leftwich and then David Garrard eras, this has mostly been a backwater station and a lifeless NFL colony, in spite of the franchise’s close proximity to college football powerhouse, Florida. Even their mascot decided to hang it up after last year. Although not quite as poorly attended as you’d be led to believe, Jacksonville nonetheless has not made the postseason since 2007 or won more than five games since 2010. Their head coach is proving that the Seattle pedigree, like the Patriot pedigree, is not necessarily transferable, and their latest franchise quarterback – who suffers from a kind of LeBron James/Greg Oden Syndrome of looking way older than he reportedly is – quietly had an amazingly disappointing rookie season. (via free agency and trades) — RB Bernard Pierce, WR Bryan Walters, TE Julius Thomas, OT Jermey Parnell, OT Austin Pasztor, C Stefen Wisniewski, DT Jared Odrick, OLB Dan Skuta, CB Davon House, S Sergio Brown. OUT: RB Jordan Todman, C Jacques McClendon, DT Red Bryant, OLB Geno Hayes, ILB J.T. Thomas, CB Alan Ball, S Sherrod Martin. Unlike Tampa Bay or Tennessee, the presence of a QB on the roster that they had recently invested a top draft pick in meant that Jacksonville’s offseason was colored more by its pursuit of a supporting cast that can help to push this rebuilding project into another gear. 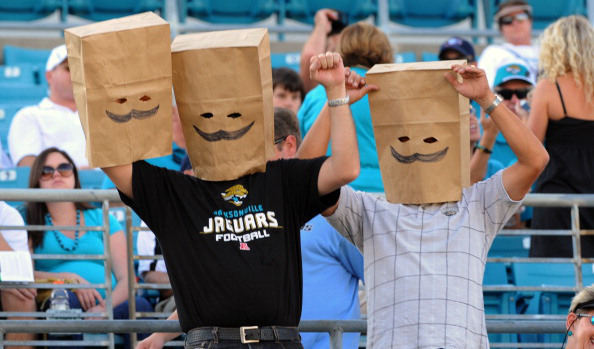 In that respect, the Jaguars product might be more palatable this season. Bernard Pierce and T.J. Yeldon should solidify the running game and open up “Offensive Weapon” Denard Robinson to do more cool things like this. The attack wasn’t even that bad last season, finishing 21st, but having a couple bona fide backs (and not Toby Gerhart) would go a long way toward improving that. The team also made a lot of moves to bolster its defense which, despite Gus Bradley’s background, has mostly been bad (26th in total defense last year, with only six interceptions). It’s mildly surprising that Davon House, Sergio Brown, and James Sample are the only big defensive back additions – they bring a combined one interception from last season and three total in the NFL – when areas like the pass rush were already fairly strong, but with Fowler they’ve definitely upgraded that without losing very much. The other thing that jumps out about the Jaguars and their additions is the offensive line upgrades and skill position players such as Rashad Greene from Florida State and former Bronco and Peyton Manning favorite Julius Thomas. The goal of those linemen, first and foremost, will be to protect the precious cargo in Bortles, as Jags QBs were sacked an NFL leading 71 times last season. That said, assuming Bortles can avoid the real and imagined tacklers who plagued him in 2014, he’ll have those two aforementioned new targets to go along with the young and improving Allen Hurns, Allen Robinson, and Marquise Lee. They were the 31st ranked passing attack last year but if they finish near the bottom again, it won’t be for lack of weaponry. Jacksonville is an interesting case among the cellar dwellers. While they shouldn’t be confused with a contender, they have a roster that could reasonably meander its way to six or seven wins without any major heavy lifting. On the other hand, though, they are in many ways a bigger question mark than teams with rookies at the signal caller position. Put simply, Blake Bortles was horrendous by every objective measure last year — even the vaunted “eye test” revealed him to be an eyesore. Assuming General Manager David Caldwell isn’t just bloviating and Bortles really is like a new player, the schedule isn’t inordinately daunting. On the other hand, when you’re 3-13, a pair of games against the Titans, one each against Tampa Bay and Atlanta, and maybe the trip to New York to play the Jets are probably your best bets. This is the NFL, though, so the Jags will probably upset at least one team they have no business beating (looking at you, San Diego). Overall, the struggles for Jacksonville begin and end with Bortles and his unforced errors; 18 of their 26 turnovers last year were interceptions thrown or fumbles lost by him. If he can cut down on those bad decisions, the offensive line can stop functioning like a sieve, and Bradley’s defense finally emerges as a solid, cohesive unit, perhaps the Jaguars will have London calling for them to stick around long after this year’s trip. Prediction: It probably isn’t the boldest step, but we’ll say that Bortles cuts down on the picks, but not necessarily enough to save Bradley from a pink slip at season’s end, after the Jags have finished 5-11.